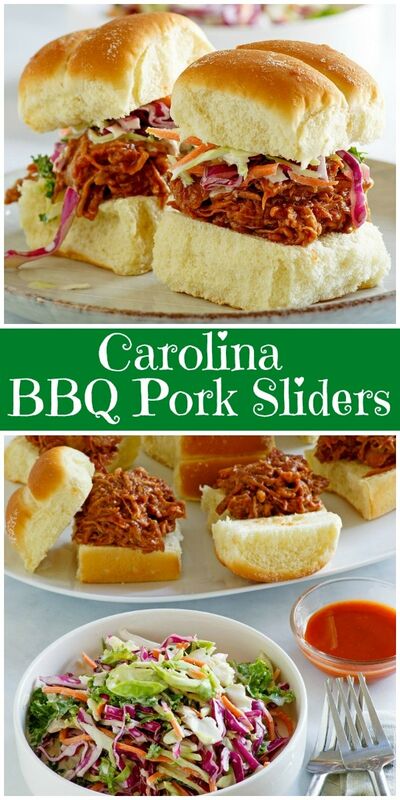 These Carolina BBQ Pork Sliders are a slow cooker recipe that is perfect for parties. This recipe makes about 24 sliders (small sandwiches). 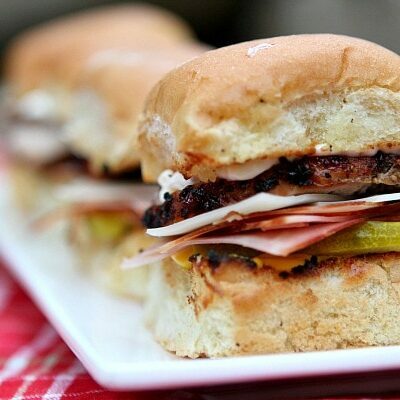 Sliders are great for serving at parties. People appreciate having a few filling recipes to choose from at a party. 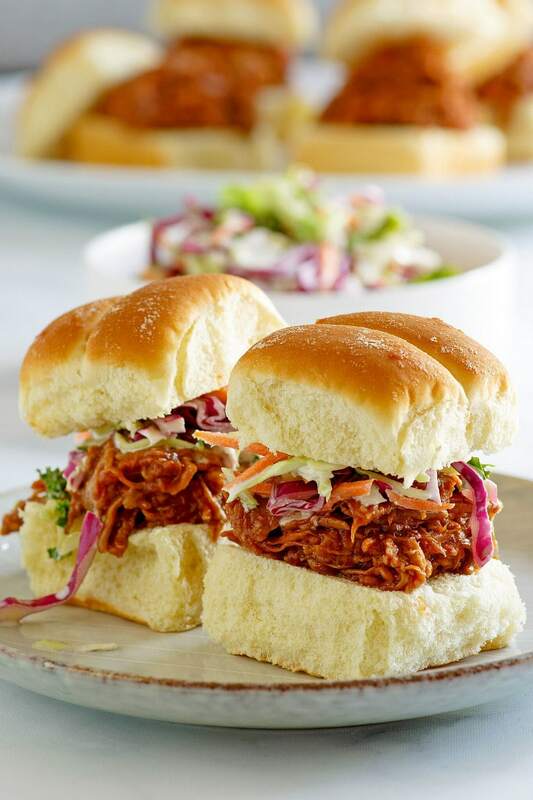 Things other than dips are most welcome, and a platter of these Carolina BBQ Sliders is usually completely devoured. I suggest serving them at a sport’s themed party or a casual gathering with friends or relatives. 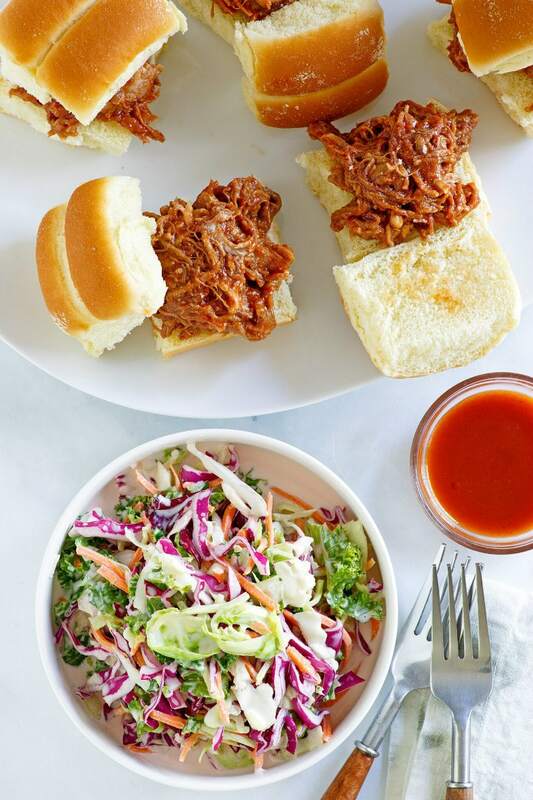 The best kind of pulled pork is made in the slow cooker. Thats how the pork is made for these sliders. A slow cooker takes the stress out of cooking, and it happens to do wonderful things to pork. After slow cooking all day with a handful of spices and other ingredients, the pork pulls apart so easily and is ready to pile onto rolls to create Carolina BBQ Pork Sliders. 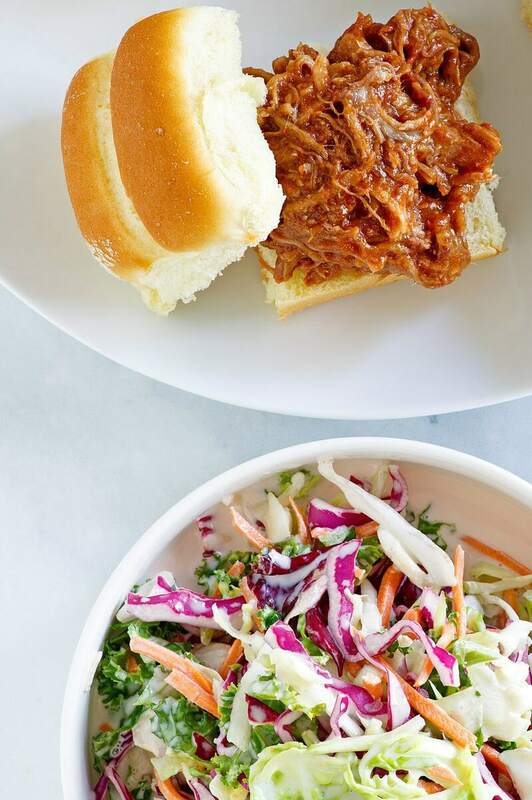 The best pulled pork sliders are served with cole slaw. It’s delicious served on the side, but a lot of people like to put a spoonful of cole slaw on top of their pulled pork inside the slider. 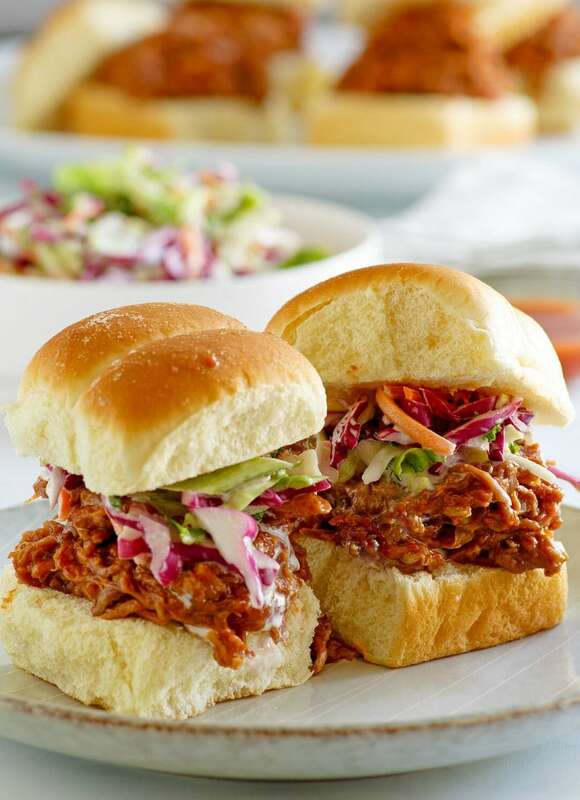 I suggest making my Creamy Buttermilk Cole Slaw to eat with these Carolina BBQ Pork Sliders. It’s perfect! What is Carolina Pulled Pork? North Carolina is known for the way they barbecue their pork. Pulled Pork is slow smoked until it’s so tender that it pulled apart easily. 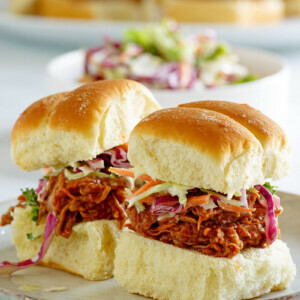 The pork is then combined with a vinegar-based sauce, and it’s served with cole slaw on a bun to make these (North Carolina style) BBQ Pork Sliders. In contrast, South Carolina pulled pork is characterized by having a yellow mustard type barbecue sauce. If you’re looking for more delicious recipes to serve at a party, you might also like to try my Philly Cheese Steak Sandwiches or these Oreo Brownies. Homemade Soft Pretzel Bites and Buffalo Chicken Dip are great party recipes too! 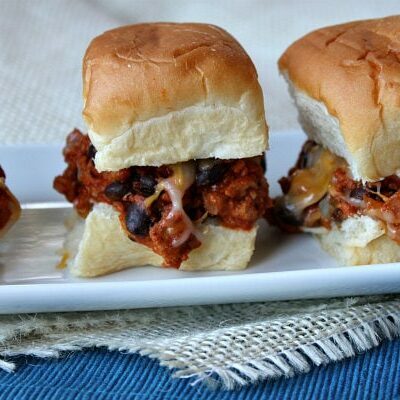 These sliders are made easy in the slow cooker, and they're perfect for parties! In a small bowl, mix 1 tablespoon of the brown sugar, paprika, minced onion, chili powder, salt, garlic powder and allspice. Sprinkle 1 tablespoon of this mixture into the bottom of a slow cooker. Rub remaining mixture over pork. Add the vinegar and remaining brown sugar to the slow cooker; stir to mix. Add the pork. Cover and cook on low 8 to 10 hours until the pork is fork-tender. Remove the pork to a cutting board and pull into shreds. Return to the slow cooker; add green onions and toss to coat. Place about 1/4 cup of the pork mixture onto each bun bottom. Add a sprinkle of hot sauce, if desired. Top with bun tops and serve immediately. Use a slow-cooker liner to save on clean-up time (Reynolds makes them). Liners also make sure your meat is sealed in & moist and they prevent burning. If you are following a special diet, be sure to check nutritional information on the rolls you purchase to make sure they do not include ingredients that might be harmful to you. This recipe was originally shared in 2007. It was edited and re-published in 2018. So easy and perfect party food! These look amazing! Making these for lunch on Sunday! 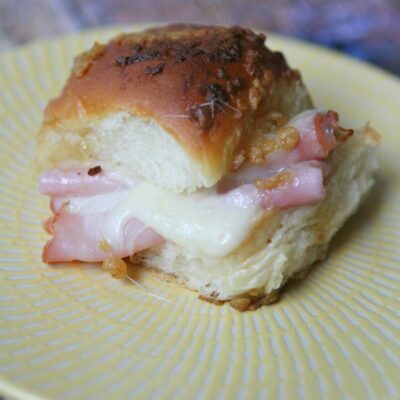 These sliders are SO easy and the results are fabulous! Perfect for our game watching on the weekends!! 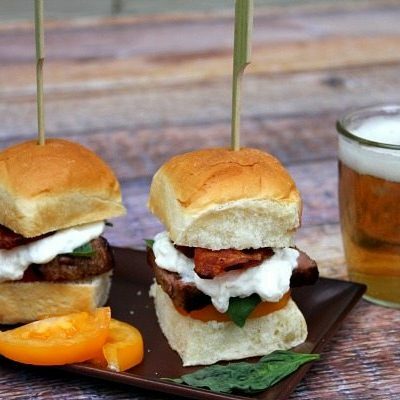 These sliders look PERFECT!! Yummy.